The new way, apparently, to break into Hollywood’s directors A-list, is to make a metaphoric tale dressed as a genre film. John Krasinski helms the new horror release A Quiet Place, after trying his hand with several episodes of The Office, the show in which he starred, and the 2016 indie feature The Hollars. He also co-wrote the screenplay and has the benefit of his famous wife Emily Blunt as co-star in the story of a family struggling to survive in a post-apocalyptic America. Razor-teethed, spindly aliens are killing all humans they can find, hunting down and ripping them to shreds those who make sounds loud enough for them to hear. Emily Blunt and John Krasinski play Evelyn and Lee Abbott, who silently traverse the landscape with their kids, tween Marcus (Noah Jupe), deaf teen daughter Regan (Millicent Simmons), and young son Beau (Cade Woodward). They are learning how to avoid the aliens, and have had the benefit of already knowing sign language because of their daughter’s deafness. Just staying alive is a moment-to-moment challenge, and creates a near-constant tension for the viewers. As we learn early on, no one in this new world is safe. Of course, as with nearly all horror films, the reality of the proceedings is just a metaphor for something else. In this case, it is a framework to explore grief and sacrifice. and in A Quiet Place, it works. There are many touching, sweet moments, including a number of small mercies they show to each other as they go about their day-to-day lives in their remote farmstead. A scene where the parents dance together using earphones is particularly moving. Every member of the family has their own emotional baggage to deal with, and viewers get snippets of character development that make a huge difference in connecting us with their experience. Over the course of the hour and half running time, the audience becomes attached to all the Abbotts, hoping and rooting for their unlikely survival, and beyond that, wishing them a little joy. One potential for that comes by way of Evelyn’s pregnancy, which seems the height of optimism, given they have to find a way to keep the baby from screaming and calling every alien from miles around to shred-dine on them. If this all sounds rather bucolic for a horror film, imagine living on a farm where every half hour or so the sound of alien teeth chattering, or a clueless raccoon getting eviscerated, punctuates the silence. Let’s just say massage therapists will have an uptick of scheduled appointments, should this film become a hit. It may be no surprise that Emily Blunt shines the brightest here, although partly that’s because she’s given some of the most challenging scenes. As iconic, tough-as-nails cinematic mother figures go, she gives Ripley in Aliens a run for her money. It is also worth noting that in this age of appropriate casting, actress Millicent Simmons is a deaf actress playing a deaf character. It’s certainly possible they could have hired a hearing actor for the role, and it’s a relief they didn’t. While there are some callbacks to, or echoes of, earlier films, most notably M. Night Shyamalan’s Signs, what elevates this movie is the ever-present danger of the characters giving in to hopelessness and nihilism, which is as much a threat as the aliens. Finding a way towards each other, rather than letting the silence and terror sink them into darkness, is what the Abbotts have rightly determined is the key to their survival. 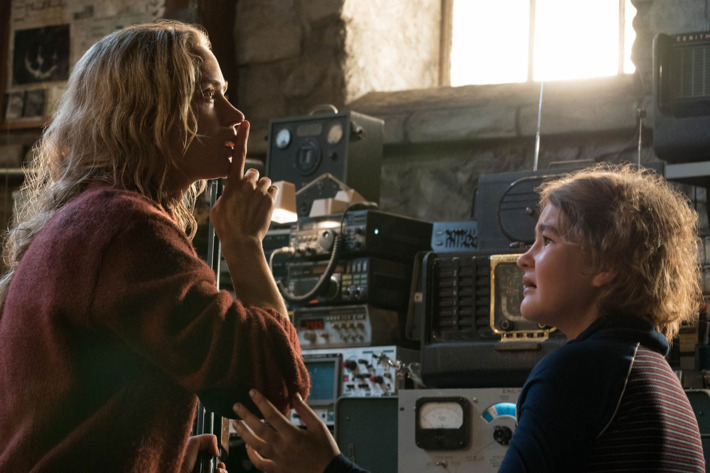 A Quiet Place is likely to be the best horror film released in 2018, as it shows a great balance of humanity and horror. For that, the acting, the directing, and writing can all take equal credit.